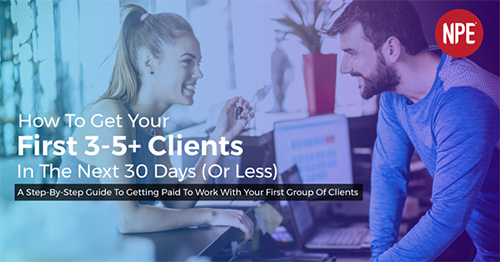 A step-by-step guide to getting paid to work with your first group of clients. Get clear on the client profile you want to serve. Learn how to connect with and engage prospective clients. Start working with your first “beta group” to build success and capture testimonials. So, you invest in yourself and put in the hours to get certified as a fitness professional and now you're excited to get going. MOST newly certified professionals get stuck. They don't progress. WHY? Because they don't “get over the hump” of finding their first client(s). They don't get a chance to build their confidence. They don't build a professional reputation. And they don’t make any money. Which means they eventually give up on their dream of building a career in fitness and move onto doing something else. 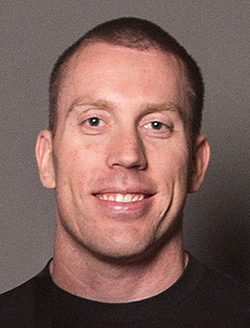 Many successful fitness professionals and business owners with stellar reputations started out EXACTLY where you are–with the same fears, concerns, and doubts. But they moved forward successfully because they 1) sought out direction on a path forward that would lead them to their goals and then 2) they TOOK DECISIVE ACTION. They didn’t wait for “one day where the stars magically aligned” for everything to come together. They learned what they needed to do, and just simply took steps forward to get moving in the right direction! And here’s how you can do the same. Most fitness professionals struggle because they are trying to talk to everybody. The 80-year-old man who wants to recover from injuries. The kid after school who wants to improve athletic performance. The mom who wants to lose weight, lose inches, and regain energy. Or the guy who wants to get ripped. Fitness professionals think that they should take on working with anyone and everyone because they’re afraid to turn down work. But the truth is, when you’re trying to talk to everybody, it’s nearly impossible to get any traction. Prospective clients don’t know what you stand for, how you can help them, and why they should believe you. Here’s a better strategy: Get very clear on who you want to serve. What type of clients inspire you? Who do you really want to make a difference with? One of our high six-figure fitness business owner clients was an accountant who decided she hated accounting and wanted to help pregnant women and young mothers improve their fitness. Another client was a fireman who as a boy had recovered from a serious muscle-based illness through weight training and started a club to help teenagers learn strength and conditioning. A third struggled with parents who suffered from diabetes and high blood pressure and wanted to help people lose weight and keep it off. Whatever it is, there is someone you are driven and motivated to serve. And in the service industry, it’s about the clients (not you). Who is it that you’re most passionate about serving? What difference do you want to make in their lives? Write down the demographics (gender, age, where do they live, where do they work). Then seek to understand what drives them... so you can better communicate and lead them to success. What do they want? What challenges are they facing? What does success look like to them? And what does failure look like? Write these down and get as clear as possible. Then you’re ready for the next step. They think they need to learn 20 marketing strategies and apply them all at the same time in order to sign up new clients. So, they struggle to learn Facebook ads and Google adwords while trying to master social media (posting content every day to build a big following, focusing on likes, comments, engagement). But none of that (really) matters. When you’re trying to get your first few clients, keep it simple. The only thing that matters is booking consultations with prospective clients, executing those consults as well as you can, and signing up your first 3-5+ clients. The key is focus: Go hard and take consistent action every day until you’ve hit your target. Second, position yourself for success. Clean up your social media profiles (Facebook and/or Instagram, LinkedIn, etc.). If you’ve got anything unprofessional on there, delete it. Post a few simple messages, images, and videos showing who you are, what you do, you with the people you want to serve and DOING the work you love to do. Third, create a simple 1-2 minute video sharing why you became a fitness professional. State WHO you help and WHAT you help them with (the same messaging from above). Add what success looks like, what results you will help them achieve, and what obstacles you will help them overcome. Research–find groups where you can connect with people that either ARE or KNOW your avatar, online and offline. Listen–Go where they are. Listen and watch the conversations and dialogue. What are they talking about? What language do they use? How can you best speak/talk/engage the conversations they’re already having? Advance–Go up and introduce yourself. Send DMs. Ask questions to get to know them, build relationships and ask if you can help them (when appropriate). Engage–When someone says “yes,” get together for a consultation. Ask them more about: 1) their goals 2) why they’re important to them and 3) how committed they are (scale 1-10). Then explain your offering and position the opportunity for being a new client (beta = must be committed to success and willing to share their story with others when they succeed). Your goal is to kick off your first beta group. You need experience and to build proof you can deliver results. This is more important than money, because you’ll turn it into much more money later. But to succeed, you need people who are motivated and driven to DO THE WORK. It’s good for them to have some financial commitment, or “skin in the game.” This is the only time I’d advocate “discounting.” Make them a great offer they can’t refuse (whatever works best) and get to work. The fitness industry is currently caught up in trying to find “magic” Facebook ads and marketing software platforms–and thinking they need to learn a million advanced tactics to continue growing. But NO MARKETING strategy, messaging, software, or advertisement will EVER overcome poor service delivery. You can’t out-market a bad service. So, serve the heck out of your beta group so you can market a great service. Your goal is RESULTS. Lead people to overcome their challenges and achieve their goals, such as improving strength, weight loss, getting out of pain, improved energy, and recovery from injury. Master documenting results. How do you know you’re delivering a great service? Simple–your clients are happy! Focus on consistently delivering extreme value and results. The testimonials and referrals will follow. People connect with other people and their stories (and see themselves in your past clients). Sharing stories and showcasing RESULTS are the best marketing strategies you will ever have for your business. Document using short testimonial videos and client interviews when they talk about their journey and how you helped them. Ask clients to give you reviews on Google, Facebook, Yelp, etc. And that’s how you build momentum with ALL your marketing efforts. A few years ago, it was all about what you said about yourself. You controlled the message. But thanks to the rise of the internet, public review sites have created a new “trust-based” economy. Success (in the eyes of the market) is all about what other people have to say about you. So, work hard to passionately serve, over-deliver, and ask happy clients to share their experience with others. Learn how to do that well, then leverage your reviews and referrals to connect and engage with more people you can help. Rinse, and repeat! You need to pick a target market, and get extremely clear on who they are, what they want, and how you can help. Create your targeting message, “I help <target market> achieve <successful results>.” Make a short video that contains a beta group offer. Share your video on social media, with your friends, and ask them to share to their communities. Keep going until you have 3-5+ beta group clients. Then serve them, “over-deliver” results, and document success. Finally, build your professional reputation by sharing your online portfolio of success stories. Rinse and repeat.